A must for every sewer and quilter. Easy to use and it threads your needles with a simple push of a button. The threader has a built in cutter. 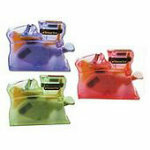 They come in three colors Purple, Green and Pink threaders. Please add in the note section when ordering what your first and second choice of color is. We will try to accommodate your color choice.